'Lost Blackpool' is the theme this week - and I'm resisting the temptation to lament the sad decline of our local football club. I explained in an earlier blog (Tangerine - Follow Your Dream, 22/08/2015 if you're interested), how I was born and spent my early years in Africa and how the Seasiders became my lifelong footballing passion because they won the FA Cup in the year I was born. We used to have monkeys in our African garden and zebras and elephants wandering through the grassland beyond the compound. Ilorin, the nearest town, meant 'town of the elephants' in the local language. Occasionally a leopard would make off with a goat. I grew up with such beasties and took them all for granted (plus the snakes and scorpions, of course). 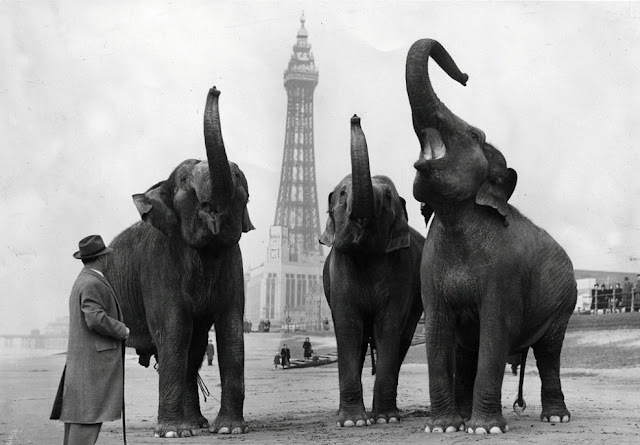 For people living in the hills, dales, mill towns and big cities of north-west England, sheep, cattle and horses were about as exotic as it got...until they rode the charabanc or train into Blackpool on holiday and visited the Tower menagerie. 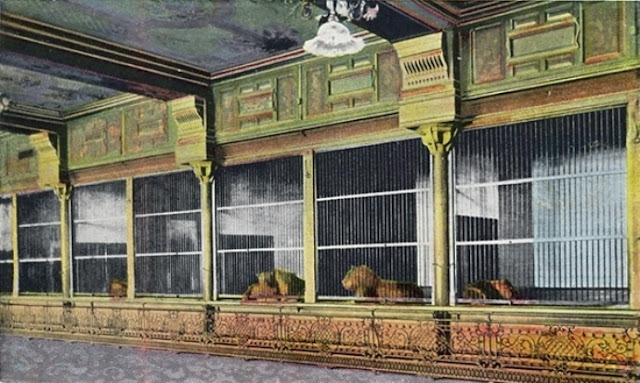 Legend has it that Dr. Cocker's Aquarium, Aviary and Menagerie, to give it its full title, was first established on the site in 1873 and functioned as a source of revenue while the Tower was being built around it in the early 1890s. When the Tower finally opened in 1894, the aquarium, aviary, menagerie and a permanent circus were among its major attractions for decades to come. Its collection of birds and animals was regarded as one of the finest in the country in the first half of the last century. Apart from the extensive aviary, there was a monkey house with a variety of primates including chimpanzees and mandrills, a reptile enclosure containing crocodiles and turtles and an array of cages housing bears, cheetahs, hyenas, leopards, lions, a black panther, porcupines, sloth and tigers. Visitors could wander round and marvel at the sights, sounds and smells in ornate surroundings, even take afternoon tea within view of the creatures on display. Regardless of modern-day views on the ethics of keeping wild animals in close confinement, the inhabitants of the Tower were, by all accounts, well cared for and bred quite successfully. It must have been an extraordinary thrill to encounter such exotic specimens for the first time. Underneath the menagerie was the elephant house, elephants being a big attraction of the Tower circus. On early mornings when the tide was out, it was not unusual to see the elephants strolling on the sands for their daily constitutional. How fantastic must that have been? and scare old spinsters sitting down at tea. in gilded cages in the air? Thanks for reading. Those of you who've been there, seen that - let me know what you think. It must have been there in the late 50's early 60's because I remember the black panther. Only time I have ever seen one. beautiful beast. Lovely poem. Very evocative with some great images (plus the photo of the elephants). Brilliant. I love this. Well done Steve. You have a wonderful way with words.Love this blog. I visited as a child in the 60s and thought it was cruel to keep those fine animals in such a confined space. Plus it stank! I'm told (don't know if it's true) that they used to take the lions for 'walkies' on the sand as well - tethered to a Land Rover so they couldn't go after the donkeys! A fascinating blog. I remember the this well from childhood visits to Blackpool. I suspect your imaginary menagerie is a happier place than the old tower zoo ever was. My mum and dad used to go dating at the Tower zoo - quite the thing back in the 1930s apparently. I found this fascinating to read and it's a super poem.